Used for final finishing work, this Plane has a perfectly flat sole that will smooth any wood surface. Features include hardwood handles and knobs, full plane iron adjustments, cast iron bases, frog and lever caps, chip breakers and knurled brass adjusting nuts. Beautifully made with precision fit and finish. I love my grizzly plane. All these years I thought I knew what a sharp plane and flat sole was, but my grizzly plane has raised my future expectations. I plan on upgrading my older planes to grizzlys soon. I purchased this plane with no expectations. I was pleasantly surprised when I checked the plane out upon opening the package. At the price the plane could not have been "finished" like the $200 planes on the market but the finishing process was not as extensive as I had anticipated. On receiving a new plane there are several things to do besides sharpen the blade. I was pleasantly surprised that the bottom of the plane was fairly flat and required less time to flatten than I anticipated. I have not used it enough to determine the quality (read edge holding) of the blade but there are several very fine replacement blades of good quality steel out there. I figure maybe 4 hours work in total to get the plane where I want it. At this price point that is a bargain. As a professional woodworker I use planes quite a bit. This size is not a constant in my hand so I did not want to spend $300 for a premium plane. I feel I receive good quality for what I wanted. I own several Grizzly machined in my shop and while they each needed a little "tweaking" once done, they purr like my shop cats. I recommend this product. I bought this as my first foray into handtool woodworking, and found it to be a joy to use once you sharpen it and do the initial setup. It would have been nice if there was at least a single-sheet user manual to go with it as, once I had it apart, trying to figure out the right way to put it back together was a chore. I would definitely buy it again if I had to. Great product. I use it wth my 22 inch planner to flatten a live edge oak table top. All of my Grizzly tools have proven to be of excellent quality and great value. I just got this plane. For the price, I'm not sure you can beat this plane. The sole and blade were dead flat. The weight and feel of it is good. There was a tiny nick in the blade and it was not what I would call sharp. It looked to be sharpened to about 400 - 600 grit. I had to put it on the grinder to take care of the chip and then sharpened it to 8000 grit. It took a looong time to sharpen, so it's good tool steel. I did about an hour of planing and the edge held up great. Bought this plane based on reviews and price. It works great, the iron is extremely long almost so long that it won't fit with the chip breaker attached. That just means there will be many years of use out of it. The sole is not quite as flat as I would like it to be, so I anticipate an hour's worth of tuning, but it is a great, quality product. 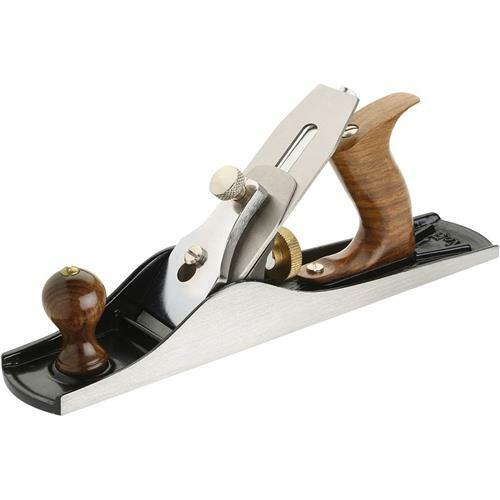 I bought this plane a few days ago the shipping was quick and as soon as I opened the box I sensed quality the sole is perfectly flat like they say and the blade was sharp It sure does make nice thin shavings. I look forward to buy more grizzly tools down the road.